The Pentagon gave a controversial UK PR firm over half a billion dollars to run a top secret propaganda programme in Iraq, the Bureau of Investigative Journalism reveals. 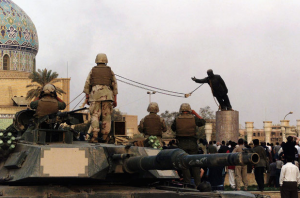 Toppling the statue of Saddam Hussein was a staged event, by U.S. soldiers, for the media. A Reuters long-shot of Firdos Square where the statue was located shows that the Square was nearly empty when the statue was torn down. The Square was sealed off by the U.S. military. The 200 people milling about were U.S. Marines, international press and Iraqis. However, the media portrayed it as an event of the Iraqi people. This investigation was published in collaboration with The Sunday Times. It is part of a series by the Bureau of Investigative Journalism looking at the use of military contractors worldwide and was written by Crofton Black and Abigail Fielding-Smith.